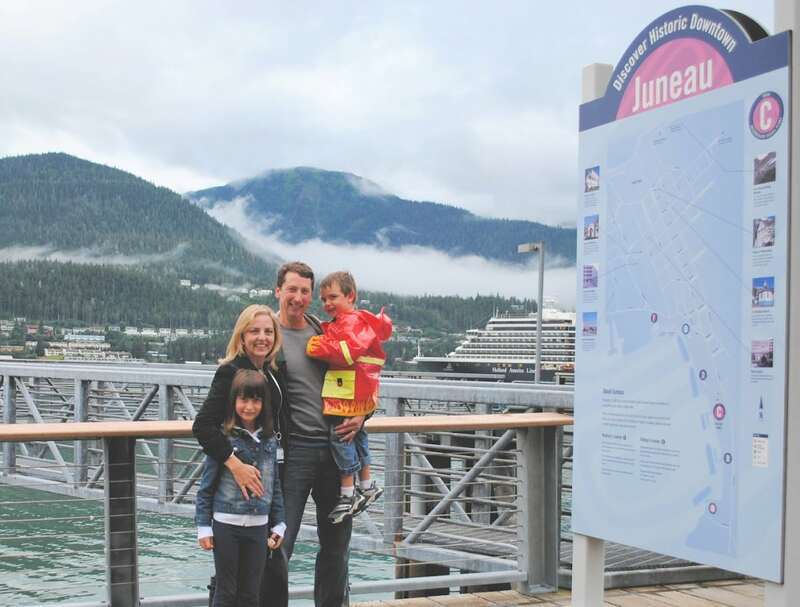 Families will love exploring Juneau, Alaska with kids. The area’s natural beauty and the city’s walkable downtown lure visitors here by the boatload…literally. Although technically you can drive to Juneau if you put your car on a ferry, most visitors arrive via cruise ship (or plane). Take a look at these fun things to do in Juneau with kids. Although Juneau is the second largest city in the U.S. in terms of geographical size, it is home to just 32,000 residents. Upon arrival in Juneau, the first thing you will probably notice is the whir of seaplanes taking off and landing in the port waters. Propeller engines provided an exciting alarm clock aboard our Celebrity Cruise ship, Solstice. 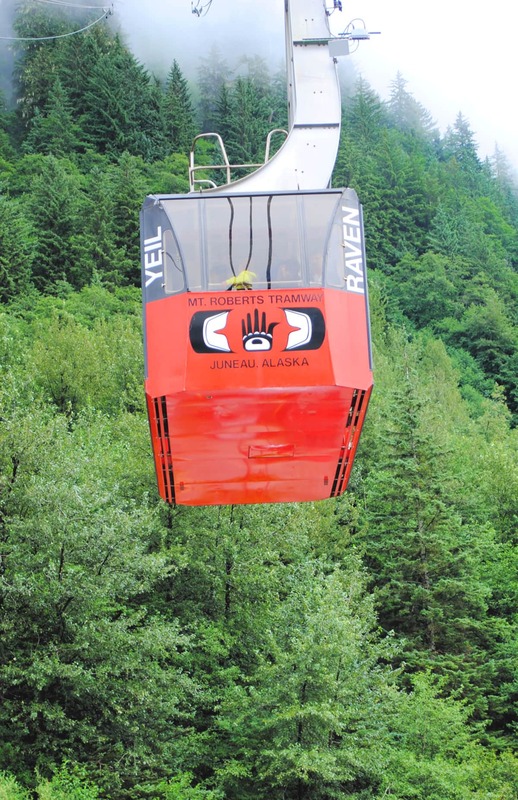 If you arrive via cruise ship, upon disembarking you will find the bright orange-red Mount Roberts Aerial Tramway. It whisks vacationers from the cruise ship dock to the 1,800-foot sub-alpine level of Mount Roberts via an enclosed gondola. On a clear day, you can take in one of the most expansive and breathtaking views in all of Alaska from here. 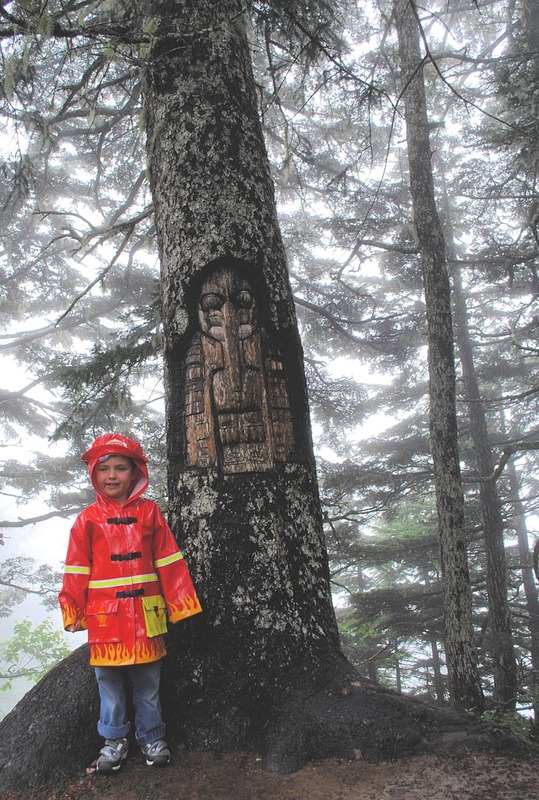 It was foggy, however, the day I visited Mount Roberts with my then 5-year-old son. You can book the Mount Roberts Tramway excursion through Celebrity Cruises but you save a couple of bucks by just riding on your own. Children 5 and under ride for free. The mist blocked the view from Mount Roberts, but gave our hike through the rainforest atop Mount Roberts an otherworldly feel. Well-marked trails are available for all levels of hikers, with one trail suitable for strollers and wheelchairs. Serious hikers can climb another 300 feet to reach the true alpine forest level. Be sure to look for the living tree carvings on the easy Alpine Loop Trail. These are modern-day examples of Tlingit carvings. Markings like these were once used by Canada’s native people as notices of different tribes and communication tools. 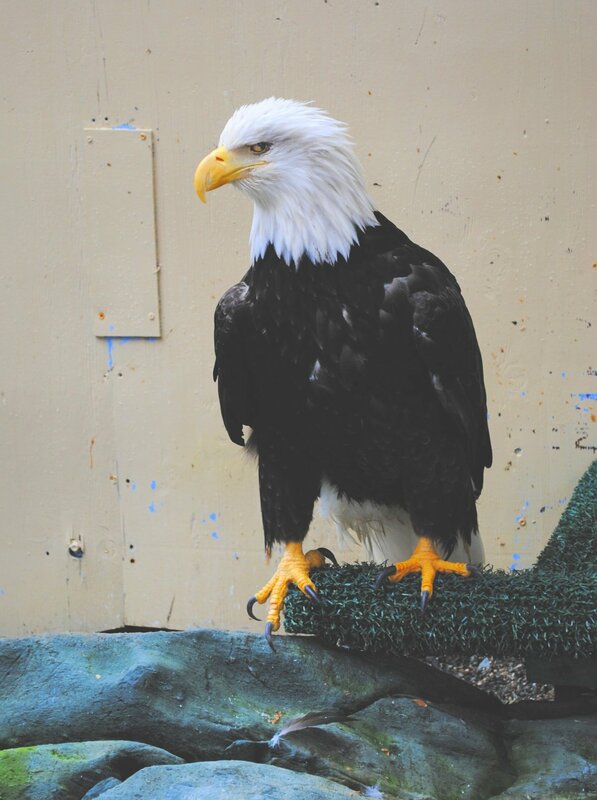 A live rescued bald eagle is on display at the Juneau Raptor Center on Mount Roberts. This will likely interest your kids, for a few minutes at least. The non-profit center rescues over 100 sick and injured birds every year. The Timberline Bar & Grill at the top offers food and drinks to visitors. Of course, there’s a souvenir shop that’s willing and able to snag some of your dollars in exchange for a trinket or two on the mountain. 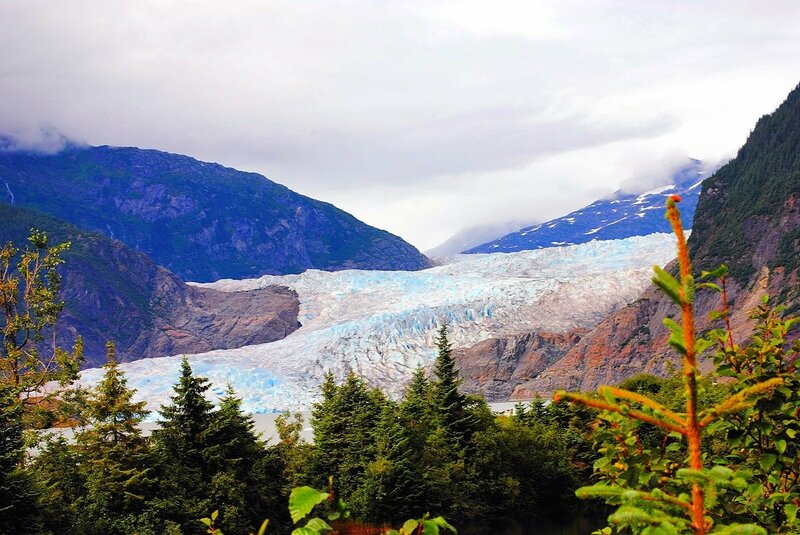 Mendenhall Glacier is the main attraction in Juneau, drawing over 400,000 visitors each year. Numerous shore excursion options tantalize cruisers in Juneau, many of which include a visit to this vast glacier. There are lots of glacier tours available from TripAdvisor as well. Other Juneau cruise excursion options include halibut fishing, lake kayaking, a salmon bake and zip-lining. With Celebrity Cruises, a tempting option is Dog Sledding On The Mendenhall Glacier Via Helicopter. Since most visitors come to the state in summertime, Alaskan dog-sledding excursions tend to be via wagons over dirt. With this excursion, however, you board a 30-minute flight over icefalls and jagged mountain peaks before landing on a glacier for a snowy dog-sledding adventure you won’t soon forget. 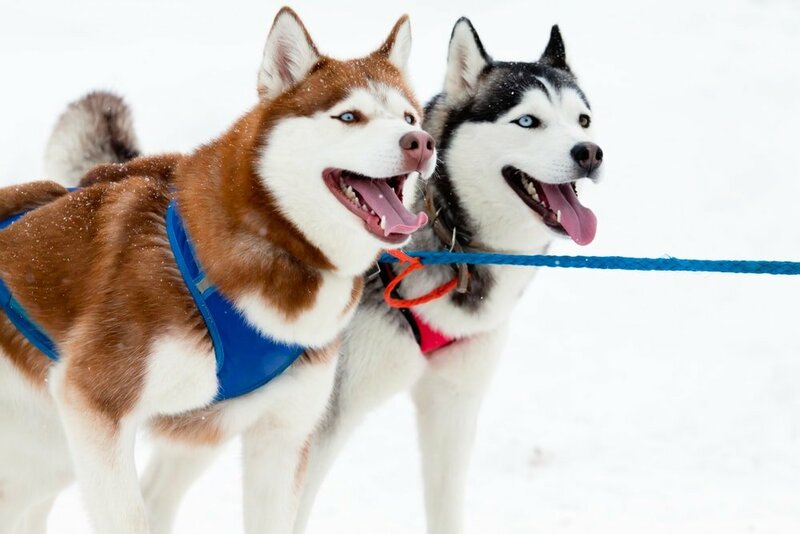 Ever since I led a team of huskies through a Quebecois wintry wonderland a couple of years prior, I had been itching to share a dog-sledding adventure with my children. Alas, the hefty price tag kept us grounded in Juneau. Instead we opted for a more affordable summer dog-sledding excursion in Skagway. While we had a blast, if you have deep pockets and an adventurous spirit, I’d go for the Mendenhall Glacier dog-sledding adventure! My family had originally signed up for a whale watching excursion to view wildlife like whales, sea lions, porpoises, seals, bald eagles and other animals from a sea catamaran. After a few days at sea, however, my motion sickness was acting up. Thankfully, it was easy to cancel our reservations for a full refund and book another excursion at the Celebrity Cruises Excursion Desk aboard our ship. We wound up embarking on a Discover The Mendenhall Glacier tour instead, a simple 12-mile bus-ride from downtown Juneau to the famed glacier where we could explore at our own pace. When you arrive at Mendenhall Glacier, I suggest heading to the Visitor Center first to watch a short film on the glacier’s history. This will make viewing the glacier more meaningful. The film is especially helpful for children, who will learn about the enormity and importance of glaciers. The short movie teaches visitors how climate change is affecting the glacier and other key facts. A small gift shop in the Visitor Center may help parents keep children engaged. I let my son pick out a bear-shaped key chain, with one condition. I told him he had to be on his best behavior during our hike to earn the tchotchke. It worked! “How cold is the water, honey?” SO COLD! Distances at Mendenhall Glacier are deceptive. It appears as if it’s a short stroll from the Visitor Center to an accessible patch of the glacier. It would have, however, taken much longer to reach the ice than my son’s young legs or patience would have allowed during our 1.5-hour visit. Of course, you will have to go touch the water to see how chilly it is. Mendenhall Glacier resides inside the Tongass National Forest and offers several hiking trails. The Photo Point Trail is an easy, stroller and wheelchair-accessible 20-minute trail that affords the best sweeping views of the glacier. Another option for those with a limited schedule is the Trail of Time; pick up a self-guided walking brochure from the Visitor Center before embarking on this trail. It gives some history of the glacier and Mendenhall Valley, and can be used almost like a scavenger hunt to keep kids engaged. While exploring Juneau’s downtown, I asked three different locals where to go for great seafood with kids. Every one of them pointed me to Twisted Fish Co. Alaskan Grill. They warned me that this restaurant gets very popular at night with long waits. 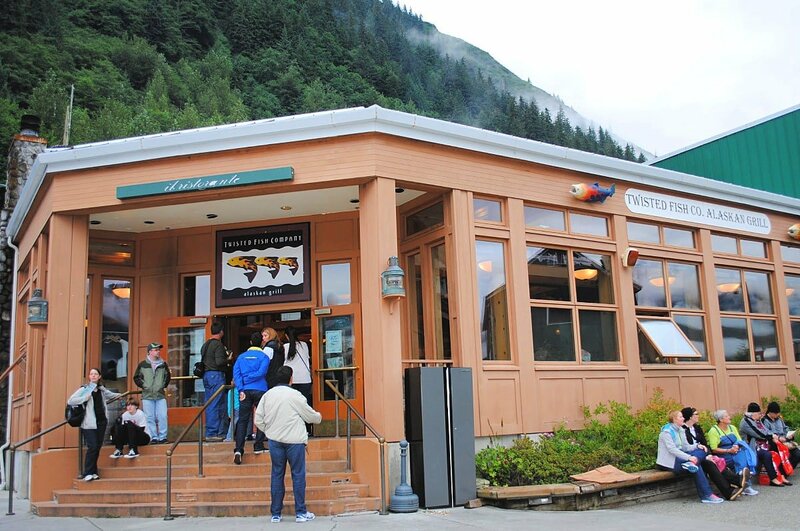 Therefore, before our bus ride to the Mendenhall Glacier, I stopped by the restaurant to make a reservation. I suggest you do the same thing the minute you arrive in Juneau. That evening we bypassed crowds of hungry patrons waiting outside as we were whisked inside Twisted Fish’s homey, blond oak interior. Choose from local favorites like Alaskan wild salmon, halibut and king crab legs. The Cedar Plank Salmon served with Bourbon Molasses Sauce on the side, while not fancy, was the best salmon I have ever eaten in my life. It was so fresh, so light, so flakey, just SO. There are fish n’ chips, burgers and pastas available for kids and picky eaters too. Located at the cruise port across from the Mount Roberts Tramway, the location can’t be beat. Ask for a table near the windows to watch the floatplanes whirring across the water. Then toast your good fortune, which brought you to this slice of northern paradise. 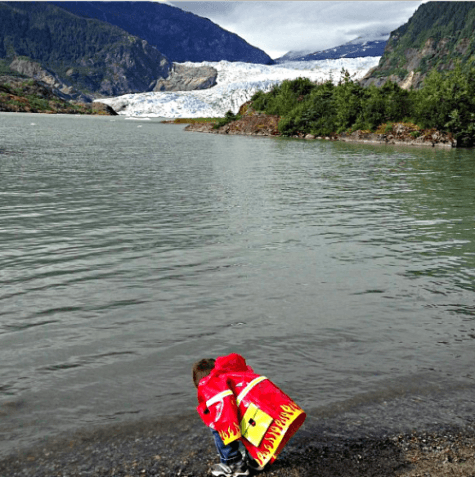 After a long day of touring Mendenhall Glacier, hiking the Tongass National Forest, and sitting still during a seafood dinner, don’t be surprised if young children become a little antsy. What can you do to get kids to burn off those extra wiggles? Click the image above to watch a short video of how we kept our little guy entertained while waiting for the bus to take us back to our Celebrity Cruise ship! Considering a trip to Juneau, Alaska? Be sure to save this list of things to do with kids! Just pin the image above to Pinterest. Go ahead and follow Travel Mamas on Pinterest while you’re at it. If you’re thinking about taking an Alaskan cruise, take a look at this round-up of Celebrity Cruise Line’s ports of call in Alaska. Read reviews and book your Celebrity Alaskan cruise via CruiseDirect. 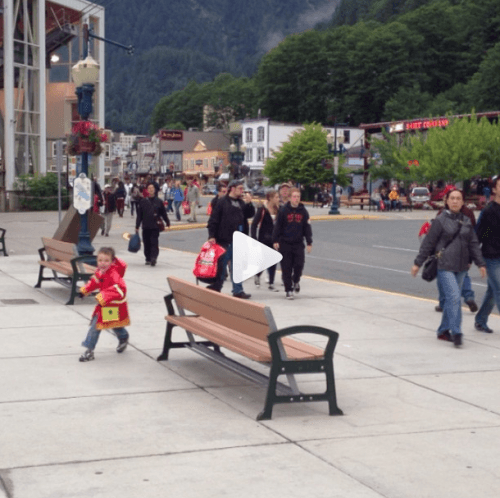 Have you been to Juneau, Alaska with kids? Add your comments or questions below! A Note from The Travel Mama: Celebrity Cruises hosted my family during our 7-night Alaskan Cruise aboard Solstice. We paid for all shore excursions ourselves. All opinions are my own, as always. This story originally posted in 2014 and was updated in 2019. Love the running around the bench video! We cruised in Alaska just before Emma’s 4th birthday so we had similar experiences. We went on the whale watching and Mendenhall Glacier tour and then took the Mt. Roberts Tramway to the top of the mountain. Most of us loved the whales but Emma lost interest after the first couple of sightings. Fortunately they were feeding her smoked salmon on the cruise so she was content to just sit and eat! Wow! I’m just impressed that a 4-year-old was gobbling up smoked salmon! A lot of people warned us not to visit Alaska with young children but we really had an incredible time. Wow- what a beautiful trip! We’d love to take the kids there someday- I was in Alaska years ago in July, so it was land of the midnight sun. What an experience. Taking a cruise there together is absolutely something I would love to do with them. Farrah – My kids really loved Alaska. The key is to pick a bunch of kid-friendly onshore activities! hello! can you by any chance recommend any of these activities?? I’m desperate to find things to do while off the cruise ship for our toddler! thank you so much. we will be porting in Ketchikan, Juneau, Skagway. Amy – Check out the round-up post I wrote about our Alaskan cruise, which includes recommendations for all of the ports you mention: https://travelmamas.com/celebrity-alaska-cruise-ports/ From there you can click through to stories to each particular destination. Although I was not traveling with a toddler, I did visit with my then 5-year-old and then 8-year-old. I don’t think summer dog-sledding would be a good idea with a toddler but any of the activities I mention in my Juneau story would be fine with a tot. In Ketchikan, you can get off the boat and wander around the cute little town with your wee one. Have a wonderful time in Alaska! I had no idea there was so much to do here. And the weather doesn’t look that bad. It seems to be just like Canada in summer! I heard Juneau has a fantastic farmer’s market. Did you get to that? I’m keen to try birch syrup which I think a few places make in Alaska. Jody – We didn’t see the farmer’s market on the day we visited, unfortunately. The weather was quite warm during our Alaskan cruise. They were experiencing a record-breaking heat wave, in fact! I found it on pinterest while homesick and looking photos. I do have a few suggestions: when at all possible while buying tours, I definitely recommend buying from the docks, you can often negotiate the price of the tour and a lot of them are the same tours you get off the ships, and some are tours offered by local tour groups. All of which are properly and legally insured. For example, there is one tour that goes about 25-30 miles out of town (or as we call it, “out the road”) and takes you to a place that only locals know about, The Shrine of St. Theresa. Beautiful place, and great for running around/running off energy. I don’t know if they still do it, but with buying tours off the docks, you can always ask what they offer that the ships don’t, and again, with a lot of them, you can negotiate the price and have a wider view of what options you have for kids. If the kids are old enough, Zip Lining is always fun! I have had tourists tell me that the ships told them it’s not safe to buy from the docks, that is a lie and them trying to keep the commissions to themselves, however not all ships do this. I worked retail on the main strip for about 10 years and have talked to a lot of tourists off the ships and have answered who knows how many questions about what to see and what to do. Whale watching will always be a favorite. The guides are extremely knowledgeable and most companies guarantee whales or your money back, plus they usually have snacks and drinks. Salmon bake is also fun. Fresh Salmon, lots of nature to play in for the kiddos, and lots of socializing for the parents. If you go around August and September during the spawning season go to the glacier ( Go there anyways, duh), there is a bridge next to the first parking lot and it is very common to see bears catching salmon in the small stream below. And it’s about a 20 minute flat walk to the waterfall at the glacier, which makes for some wonderful pictures. I actually think they recently did some work out there to make the walk easier. River Rafting is also a fun one, and very beautiful. They have people at certain points taking pictures and at the end you have the option of buying. Not usually a crazy rafting trip, mostly a calm drift down the river, but of course check with the guides for current conditions. We did this for my 8th grade class trip, many many many years ago, and a couple years ago, before I moved, for my annual work summer adventure. If you are not traveling with kids, which defeats the purpose the article, i know, you can actually hike Mt Roberts up to the tram, and if you spend, I think, $5, you can ride down for free. Just show your receipt. I usually accomplished that by gifting myself a beer at the restaurant. The start of the trail is actually about a mile from where the tram is. Very popular hike with lots of people, and although I have never seen one on that hike, educate yourself on what to do if you see a bear (yell and scream at it while waving your hands). And while we are on the topic of bears, they are becoming VERY comfortable walking into town. If you are in town and see one, Don’t chase it or follow it. Call the police so they can tranquilize it. We are having to put down more and more bears because they find their way back after being relocated. And I have SEEN tourists chase bears that are running away scared. It’s not okay. When buying stuff, although there are a lot of cool non-Alaskan things to buy, also look for items that were made in Alaska, and look for the signs that say Locally Owned. (More than half the jewelry stores are owned by the Cruise ship companies) There is a store named TAKU that is connected to the twisted fish. A lot of their fish comes from that store and you can actually order Salmon Halibut, Smoked Salmon and King Crab Legs from them. Not cheap by any means, but worth it if you can swing it. (Been trying to get myself an order shipped to CO, but like I said, not cheap I worked about 8 seasons there, a couple year round), They do have cans and jars available too, Jars are done at the store. You can also, during the week, watch them prepare the fish through the glass. If you like local art, there is a store called Annie Kales. They usually have a local Alaskan Artist on display. Ask locals anything and everything, they can help guide you the best way possible. We definitely have our share of rude and mean tourist (People have actually yelled at me about the weather, although its been unusually nice lately, it is a rainforest and rain is VERY normal with about 60 inches a year, Even more in Ketchikan with about 115 inches). If you are extra nice to us, we will be extra nice to you. And, yes, I cannot agree more about making reservations for the Twisted Fish. It is popular with the locals and tourists so definitely make a reservation. It is also only open for tourist season which is why it is so popular. Other great places to eat are the Hangar in the Wharf, owned by the same people as Twisted Fish, also comes with great views looking down the channel, and of course, seafood. and Tracys Crap Shack, which is located next to the library parking garage. All places are popular with the locals. On our busy ship days, Usually Tuesday and Wednesday, we can dock up to 5 big ships which can be anywhere from 8-10,000 people off the ships, assuming they are full. TRY TRY TRY to get out of down town if you can. There is SO much more to see. Again, your article was great and I loved reading it! Oh my, Stephanie! Thank you SO MUCH for your wonderful tips and insight about Juneau! THANK YOU for blogging yor adventures! I am heading there this summer and devouring your posts, thanks! Kristen – So glad you’re enjoying our Alaska blog posts! Have an incredible time there this summer! Excellent tips on things to do with kids on a visit to this part of Alaska! Love the videos! Thanks for your comment, Mark! So glad you like the videos! Great travel guide and photos! Thanks for sharing all the info. May be stopping in Juneau next summer so this could come at just the right time. Interesting and helpful. Just edit the first line because Palin’s hometown was Wasilla. Palin hated Juneau and came here as little as she could. Good to know! I’ve changed the wording slightly to make this more clear in the story. Thanks! Juneau Alaska is amazing! If you are planning a trip to Alaska you must spend a week in Juneau. There are so many epic adventures just from downtown Juneau. We spent 9 days and it is now one of our favorite cities in the world. David – I’d love to go back to Juneau and spend more time there. I love Alaska so much! Thanks for sharing! We are looking at traveling to Juneau with our kids (currently 7, 5 & 5 years old) next summer!!! Jaime – Have a wonderful time in Juneau with your kids! Hi Jason – Thanks for your comment but I don’t see where I mention the Bering Straight in this story? ?